Companies around the world have adopted the Demand Driven MRP (DDMRP) methodology and experienced substantial improvements in customer service, reduced lead times and lower inventories. Introduced to the market in 2011, the DDMRP methodology is experiencing rapid adoption around the globe as companies from a wide range of segments are finding it unlocks substantial improvements in their Supply Chain Performance. While traditional challenges of cost, quality and schedule in aerospace program management (PM) keep increasing, the newer challenges are becoming more complex. Research instituted by TCS and conducted by CIMdata portrays several complexities and challenges faced by companies globally in meeting Program deadlines. There is a need of paradigm shift in the way Program, Processes and Profitability are managed. There are several opportunities which are rapidly gaining embracing Digital possibilities to leap frog with future ready solutions. Join us for a webinar, where thought leaders from CIMdata and TCS define the Art of Possible for advanced program and configuration management, to address the new challenges and leverage them to create new competitive and business opportunities. 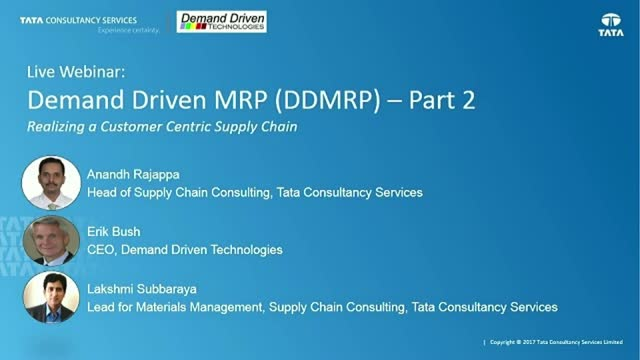 Tata Consultancy Services(TCS), together with Demand Driven Technologies will host a webcast that will introduce you to the core concepts of DDMRP and highlight implementation case studies. We’ll also include a short demonstration of Replenishment+, the world’s leading DDMRP compliant software solution. The sweeping changes in the industry have implications for every business element of the manufacturing sector — business-to-business (B2B) organizations are moving to a business-to-business-to-consumer (B2B2C) paradigm, organizations are moving from capex to opex due to cost pressures, lean manufacturing is changing to custom mass manufacturing, and globally agile product development is fast becoming the new differentiator. Original equipment manufacturers (OEMs) have realized that the current models of business are not enough to create a competitive edge. Next-gen technology is the centerpiece of this revolution. Manufacturers who will achieve success in the future will embrace technology-led innovation and embark on this transformation as a means to survive and grow in a sustainable manner. We at Tata Consultancy Services help global manufacturers over come these challenges by reducing operational expenditure, utilizing capacity optimally, and increasing efficiencies while meeting safety and regulatory norms. We are the preferred partner for a third of the Fortune 500 manufacturers, and have a record of enabling business innovation that helps them meet the objectives of global operations. The core strength of our solutions lies in our rich experience across discrete (automotive, industrial manufacturing, and aerospace) and process industries (chemicals, cement, glass, and paper). Our vertical focused Centers of Excellence (CoE) leverage this rich database to cross-reference learning and drive innovation in business solutions for standardized processes, assets and templates, ERP implementation, and continued support services. Our solutions and services portfolio spans IT-led business transformation; design, development, and support for IT solutions; and value-added services such as infrastructure management and consulting.